COOL ENERGY Various lab tests have shown that the grinding chamber cooling system designed by Rancilio LAB significantly reduces traditional dosing grinder operating temperatures, thus preserving the aromatic profile of freshly ground coffee. Its die-cast aluminium fins are the heart of the KRYO 65 OD. Thanks to its high heat conductivity, aluminium extracts and rapidly dissipates the heat generated by the movement of the burrs. 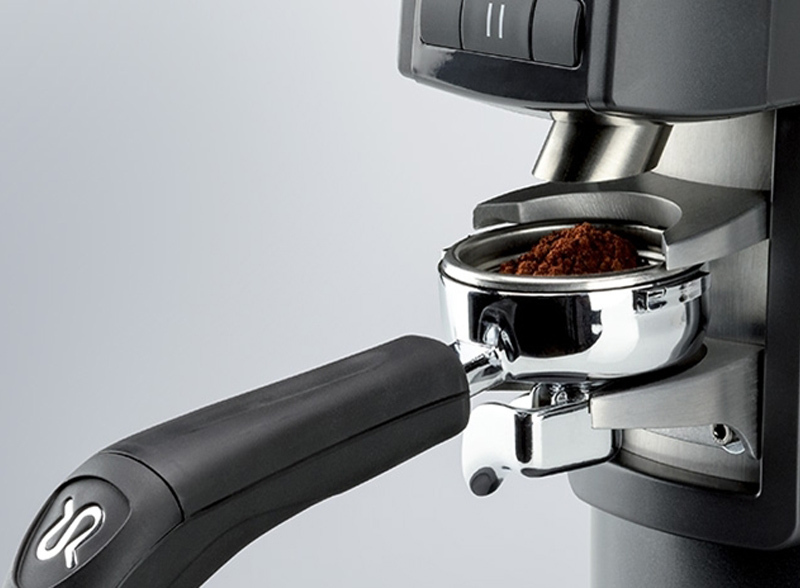 Moreover, the low position of the motor with respect to the grinding zone reduces the risk of coffee overheating. CONTROL AND MICROMETRIC PRECISION The KRYO 65 OD is fitted with a micrometric adjustment device to ensure maximum precision when setting the desired particle size. The adjustment knob combines style and ergonomics, and its orange colour highlights the importance of its function while facilitating information display and simplifying setting operations. An anti-accidental rotation lock prevents undesired changes being made to the chosen setting. ERGONOMICS AT YOUR SERVICE KRYO 65 OD is fitted with an attractively styled hopper in food-grade, shock-resistant polycarbonate, whose 1.3 kg capacity allows a classic 1kg bag of coffee beans to be poured in safely and easily. The sloped back facilitates the flow of beans into the grinding chamber. The lower closure system is perfectly integrated with the hopper geometry, and respects the forms and elegance of its design. The comfortable grip ensures ergonomic use. The hopper is easily removable and self-standing, to facilitate filling. An adaptor kit is also available for the direct installation of cans of coffee beans. TOTAL CONTROL KRYO 65 OD is equipped with an easy-to-handle, ergonomic user interface. The LED Soft-Touch control panel allows the barista to program three different doses quickly and efficiently. The rapid-selection buttons for single and double doses are joined by a third "custom" button, that in addition to dispensing ground coffee in a continuous flow, can be set by baristas according to their specific needs. The large display allows the operating status of the grinder-doser and mill wear to be monitored in real time, and can be set to notify the user when a given weight of coffee has been ground. The horizontal progress bar monitors the progress of the current grinding operation. HANDS FREE The extreme versatility of KRYO 65 OD can be seen in its many possible operating modes. The KRYO 65 OD can be activated automatically by inserting the filter holder, or by using the start button on the keypad, and ensures that the desired dose of coffee is ground instantly, whether automatically or in the "on demand" mode. The practical, height-adjustable hands-free fork is designed to take any type of filter holder during grinding operations, leaving the barista free to get on with other tasks. Thanks to this instant grinding system developed by Rancilio LAB, you will be able to monitor the total doses of coffee ground, expressed in grammes.